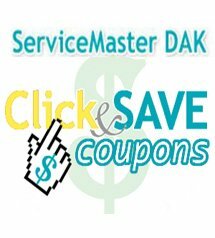 Call on ServiceMaster DAK, Long Grove IL when your home or office is in need of a cleaning. While we generally do not provide weekly or monthly cleaning services, our leading professionals can provide deep cleanings that leave your property looking like new. Before your property is cleaned, ServiceMaster DAK, Long Grove IL will send out an estimator to calculate what services should be used. By sending out an estimator, we can accurately decide which cleaning solutions and equipment are needed so there are no hidden fees. This will also determine how many technicians are needed to get the cleaning done quick and efficiently. ServiceMaster DAK, Long Grove IL will ensure your property is cleaned thoroughly the first time. We start at the top of the room and make our way down the room, cleaning fans, trims, shelves, windows, glass, doors and any other surface that needs it. We keep in mind that furniture may need to be moved in order to clean and vacuum. Rely on ServiceMaster DAK, Long Grove IL to provide professional home and office cleaning today. Call ServiceMaster DAK, Long Grove IL at 847-564-0204 when you want extraordinary service, every time, guaranteed. DAK Enterprises, Inc. owns and operates the franchise listed above. Your crew was at our home within a matter of hours of calling and were able to pull out all of the damaged areas and start the drying process. Brian & his team were great, efficient & clean. They were very helpful and answered my many many questions. They were on time. And also helped me nicely pack all of my kitchen & storage items. I was very pleased with the level of service and professionalism. Thank you again!! Why Does My Fireplace Smoke and What Should I Do? Copyright © 2019 ServiceMaster DAK All rights reserved. An independent business licensed to serve you by ServiceMaster Clean ©.